Balloon Brilliance has been servicing the Canberra region since 2001. If you are celebrating an event, contact us - we have balloons for any occasion in all different price ranges. You will be impressed with our customer service and attention to detail. At Balloon Brilliance, we cater for small celebrations, weddings, parties - right through to huge corporate themed events. I'm sure you will agree that nothing transforms an event more than beautiful, colourful, balloons. Specialising in the latest organic balloon trends - organic balloon garlands, organic balloon arches and organic balloon walls. Also specialising in confetti balloons, tulle balloons and balloon tassels. 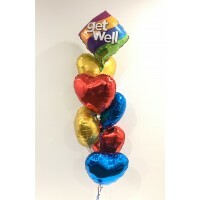 We love to personalise our balloon deliveries to make the recipient feel extra special. Whether you need An Entrance Arch, Table Centrepieces, a Dance Floor Canopy, Confetti Balloons, Tulle Balloons, Tassel Balloons, Single Helium Balloons, Floor Bouquets, A Balloon Wall, Organic Balloon Garlands, Custom Printed Balloons, or a Bouquet Delivery for a special someone - Balloon Brilliance can help you.